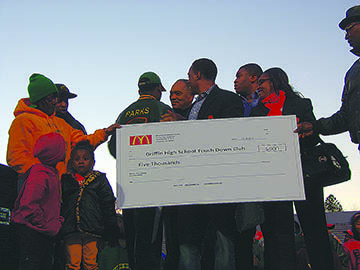 The community gathered in Memorial Stadium on Wednesday, Dec. 18 to celebrate the Griffin Bears’ victory in the Championship game against the Carrolton Trojans in the Georgia Dome on Dec 14. Bears football players entered Memorial Stadium one at a time through a large blow-up helmet as cheerleaders, coaches and community members cheered them on. There were cheers loud enough to shake the stands at the Georgia Dome December 14 after the Griffin High School Bears defeated the Carrolton Trojans 56-35 to win the AAAA State Championship. In less than three hours, the win, which gave Griffin its first state title since 1978 when the Bears shared a co-victory with Valdosta, led to the highest scoring state championship game in Georgia high school football history. It also added to an undefeated streak of 15-0 by the team for the 2013 season. Griffin’s last solo state title win happened in 1942. “Every kid in this town grows up wanting to be a Griffin Bear. The Griffin Bears are always doing well year-in and year-out and to finally put that final touch on a perfect 15-0 year ending in a state championship, it was a team effort,” Griffin High School Coach Steve DeVoursney stated. The City of Griffin and Spalding County welcomed the Bears home that Saturday night, but waited until the following Wednesday to hold a community-wide class AAAA Championship Celebration rally at Memorial Stadium where the local community could come and express support for the newly-crowned champions. “We truly appreciate your support for this season, and you coming together as a community, showing all that is good and well in Griffin and Spalding County. This was 35 years in the waiting, 35 years in the making, and on behalf of Griffin High School, I thank you,” GHS principal Keith Simmons stated to those in attendance. Devontae Freeman, safety for the Bears and one of two players who stepped in for running back Malik Miller after Miller received a leg injury prior to the championship game, was among the team members in attendance for the rally, where temperatures in the mid 50s quickly warmed up through the cheers and applause of the fans sitting in the stands. “I love it. It was a great experience, once in a lifetime. There’s a lot of love with this team,” Freeman said. 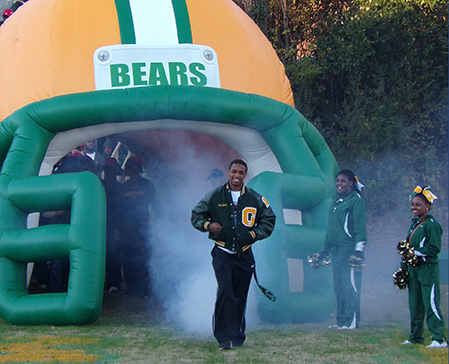 After the community cheered for the entrance of the team and coaches through a giant inflatable Griffin Bears helmet and the Griffin High School Band had performed a half-time show for the crowd, the coaches and school administrators stepped onto the stage, speaking to players and fans while giving credit to the strong season for the support of the community, the drive and determination of the players – and the performance of the players off the field and in the classroom. “Academics is what it’s all about. This was one of the highest-achieving teams coming into this season,” Griffin-Spalding County Schools Superintendent Curtis Jones said. Hours before taking the field for the community celebration, DeVoursney noted in a phone interview that without the dedication and drive in the classroom and within the players’ own homes, that the team could have faced the possibility of not showing its best while on the field. At Wednesday’s celebration of the Bears’ championship victory, McDonalds presented the Griffin High Touch Down Club with a $5,000 check, which will in turn be given to Parks and his family, whose home was burglarized during the game. “It was donated to Mr. Parks to his family. They donated it to us to give to him. We’ll just give him the check,” said Doug White, Griffin Football Booster Club president. Everything may have lined up right for the team while at the Georgia Dome, but back in Griffin things were taking a negative turn as several homes, including that of of Bears Senior Quarterback Jaquez Parks, were burglarized even as Parks and his fellow players were celebrating their victory on the field and during the bus ride home. An incident report filed by the Griffin Police Department stated an unknown number of suspects used an axe to break into the Parks home, resulting in the theft of electronics, clothing item, money – and even the textbooks Parks needed to study for finals once returning to school. Three wooden doors and several dresser drawers were also damaged during the burglary. When word began to cycle within the Griffin-Spalding County community of the thefts, individuals, groups and businesses immediately stepped up to support the high school senior whose efforts on the field and in the classroom have led to scholarship offers from educational institutions such as Harvard University and Yale University. “Yes, something bad and negative happened. But something very positive has come out of this. For the first time in a long time, this community as a whole has rallied together in support of our students and children. Not once, but twice. It speaks volumes about the type of community Griffin really is, and should continue to be,” Facebook user Bob Rice stated in a Spalding County discussion forum. Through social media, community donations and donations from local businesses, by the time the team stepped onto the field for the community celebration four days later, Parks had already received duplicates of many of the stolen items. Coach DeVoursney echoed those same feelings as he recalled the strength of Parks, the Parks family and all the members past and present of the Griffin High football team. As the year 2013 begins to come to a close and the Griffin High School Bears begin preparing for next season, there are still a few things missing – the symbolic championship rings that would normally be provided to players after a championship win. The GHS Touchdown Club is a non-profit organization composed of a small group of volunteers that does “whatever it can” to provide support to the football team, according to White. Money earned is used for the players and the needs of the team only. “Our booster club is a small club. We only have seven members. We assist the team throughout the year with needs such as food and Gatorade. We sell T-shirts as part of our fundraising efforts and make sure that their player fees get paid. A lot of the boys couldn’t even afford the player fees, which can run as high as several hundred dollars,” White said. One difficulty in finding funds for the championship rings is that the school system can not use taxpayer money to help pay for them, according to Superintendent Jones. Even though the players know that the rings are not available as of yet, it has been the motivation of achieving them that has been part of what has kept the team going, White said. When asked how he felt about a championship ring, safety Devontae Freeman just smiled and looked at his hand. “I can’t wait to get the ring,” Freeman said. The hope is to have funds raised for purchase by February. That would be around the same time that the team would start to gather to prepare for the next season, according to Griffin High offensive coordinator Justin Rogers. “This has been a fun group to coach this year. This group won the state championship back in February. Every morning starting in February we came in at 6:45 a.m. to watch film. That was way before the season even started. They sacrificed their weekends. This wasn’t anything that they worked at overnight,” Rogers said. If the smiles, pats on the back and hugs between the players and their fans at the community rally were any indication, there will be even more work taking place in 2014. “It is in the character of our kids. I think we believed in each other. We all felt like this was going to be a magical year and now it’s a reality,” DeVoursney said. “Possibly one of the most difficult parts was playing Sandy Creek, since they had won the last three out of four state championships. The team is doing great – they are excited and humbled about everything.